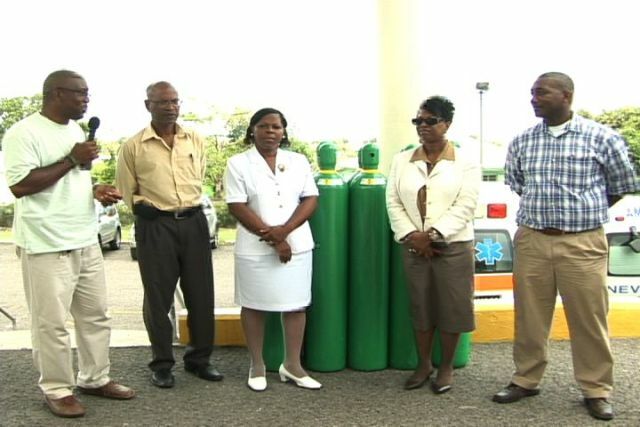 NIA-CHARLESTOWN NEVIS (July 08, 2011) — The Alexandra Hospital on Nevis was the beneficiary of 10 cylinders of locally manufactured oxygen gas on Monday, a donation the local investor Island Tyres and Hardware through its Manager Mr. Ronald Powell, deemed an important gift. The cylinders contained the first products from a brand new state of the art industrial gas plant at Prospect which recently commenced production of oxygen and acetylene. They were handed over to the Ministry of Health at a small ceremony at the Alexandra Hospital. 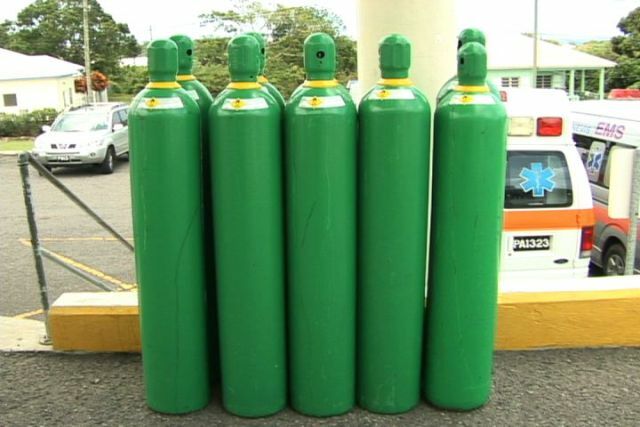 “We find it very important because as you are aware in Nevis we are now manufacturing oxygen and it is important for us at Island Tyres and Hardware to make sure that our first batch of the manufactured product is donated to the Alexandra Hospital,” Mr. Powell explained as he described the product as 99.9percent pure. “This is as pure as it can get and I am certain that all should be excited about this. In Nevis now we don’t have to import this product it is here it is manufactured here,” he added. In response, Minister responsible for the Environment Hon. Carlisle Powell who stood in for Health Minister Hon. Hensley Daniel, registered the Nevis Island Administration’s thankfulness for the donation and described the gesture as remarkable. “I think it is just remarkable that Island Tyre having spent so many millions of dollars they didn’t say let us sell the hospital the first batch. Mr. Chiverton and his family and his workers, they said let us donate the first batch to the hospital and I want to commend them for thinking first of all of the people of Nevis. “On behalf of Minister Daniel, I want to accept on behalf of the Ministry of Health and the Government and people of Nevis and to say to Mr. Chiverton that he is certainly keeping high standards in terms of his continued work and donations to health care… I want to accept and to say thank you very much,” he said. Permanent Secretary in the Ministry of Health Mrs. Joslyn Liburd who was also present at the handing over ceremony, added her thanks to Island Tyres and Hardware for its significant donation. She recalled the days when she worked at the Alexandra Hospital and Island Tyres and Hardware was the sole provider who imported the oxygen from Miami. Notwithstanding, she said it was exciting news that oxygen was being manufactured on Nevis. “On behalf of the Administration, the Ministry of Health and of the Hospital, we are very excited about this that we can just pick the phone up and have our oxygen delivered 99.9 percent pure. So again thank you very much, I know the people of Nevis too are excited about this prospect because we don’t have to wait very long for this product anymore,” she said. The Hospital’s Chief Nurse Mrs. Aldris Dias in brief remarks thanked the local company on behalf of her colleagues and noted that no longer would they have to rely on oxygen supplies to arrive from St. Kitts. Patrice Nisbett says a "healthy working relationship is in the best interest of the people of Nevis"